Western Kentucky announced Monday that it has hired Bobby Petrino as the new Hilltoppers' football coach. WKU athletic director said in a release that Petrino will be introduced at a Monday afternoon news conference. The 51-year-old Petrino replaces Willie Taggart, who left WKU Saturday to become South Florida's coach. 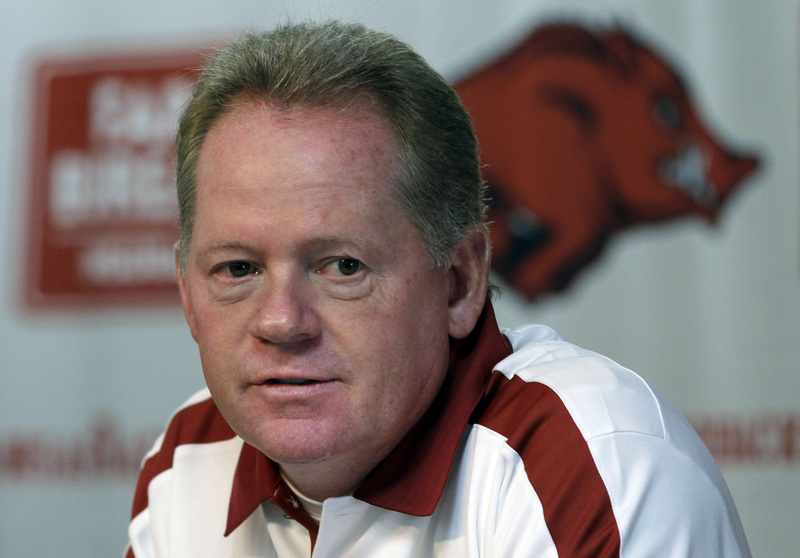 Petrino had a 34-17 record at Arkansas and 75-26 overall in eight seasons as a college head coach. He was fired by Arkansas in Aprilfor a "pattern of misleading" behavior following a motorcycle accident. Petrino had an affair with former Razorback volleyball player Jessica Dorrell, who he later hired as a football assistant had gave her $20,000 in gifts. Petrino said initially he was the only person on the motorcycle but later admitted to Dorrell's presence. That led to Razorbacks athletics director Jeff Long firing Petrino. "It was no secret that Petrino hoped to land a job further up the coaching ladder than the Hilltoppers, but his lies to Long and job-hopping past apparently made him too radioactive for any BCS-level school to touch," writes CBSSports.com's Jerry Hinnen. Petrino has been looking to get back into coaching since his dismissal. His name was mentioned recently in connection with several openings, including Kentucky and Auburn. Petrino returns to the state where he successfully began his head coaching career. He coached at Louisville from 2003-06, going 41-9 and leading the Cardinals to a 12-1 mark and their first-ever BCS berth in the Orange Bowl in 2006. From there Petrino went to the NFL. He had a brief 13-game stint in 2007 with the Atlanta Falcons. The Falcons stumbled to a 3-10 start before Petrino left for Arkansas, announcing his departure to players in a four-sentence laminated letter attached to their lockers. Arkansas had a losing record  5-7  in his first season. But Petrino and the Razorbacks improved each after that. They were to 8-5 in 2009, 10-3 with a Sugar Bowl appearance in 2010 and went 11-2 with a Cotton Bowl bid in 2011. He takes over a 7-5 Western Kentucky team that's headed to its first bowl appearance as an FBS school. The Hilltoppers will play in the Little Caesar's Pizza Bowl on Dec. 26 against Central Michigan. WKU defensive coordinator Lance Guidry was named interim coach on Saturday will coach the team in the bowl game.